Vegan Carrot Cake is today’s healthy recipe. I am going to let you in on a secret. I am probably the only person in the world who doesn’t like carrot cake. My husband on the other hand, LOVES it. In fact, he cannot go to Whole Foods without getting their carrot cake slice from the bakery. He loves the whole foods cake, but the icing is too sugary for him. So I tried to make a healthier version for him. That is how this vegan carrot cake was born. I used no oil at all in this vegan carrot cake recipe. 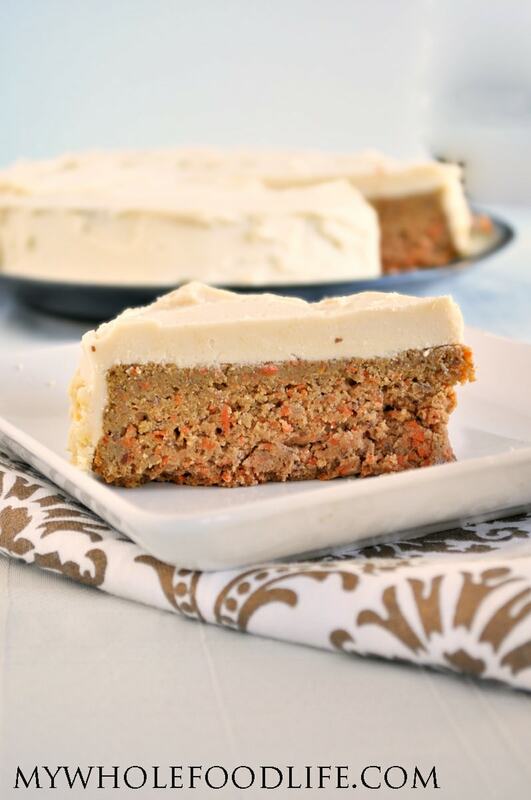 You don’t have to be vegan or gluten free to enjoy this healthier carrot cake recipe. If you like this then you may also like my carrot cake baked oatmeal or my carrot cake homemade larabars. You are probably wondering why there are no raisins in my carrot cake. Well I gotta be honest. Sometimes I make mistakes. I actually wrote the recipe to include raisins. I just forgot to fold them in the batter before I moved it to the pan. I also only made 1 pan instead of doing a layered cake because I wasn’t sure how the recipe would turn out. If you want to make a bigger cake with layers, feel free to make 2 batches of this recipe and put them together. I used my 5 minute frosting recipe to frost this, but you can use a cream cheese frosting if you like too. Looking for more carrot cake recipes? A healthier version of the classic cake! Grease a 9 inch cake pan and then sprinkle it with a little flour. Bake in the oven for about 35 minutes or until a toothpick comes out clean. Wait until the cake has completely cooled before flipping it over onto a plate. Store this cake in the fridge. It should last at least 7-10 days. You may even be able to freeze it, but I haven't tried. If you do freeze, I recommend freezing it without the frosting. Enjoy!